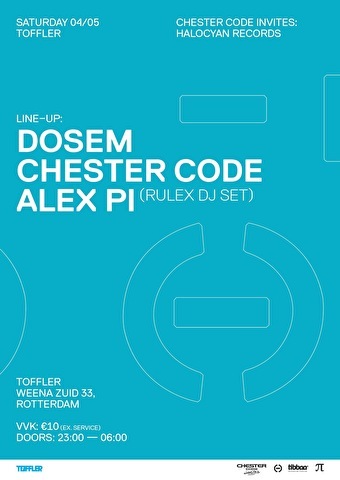 The 4th of may we are back in the TOFFLER Rotterdam for the first edition of Chester Code Invites in 2019. Since 2012, Chester Code has been organizing events with a balance between awareness, quality artists and international or exclusive locations that fit within the electronic dance scene. Beside the locations, we also select national and international artists that fit our conscious concept, which ensures a high quality event. Because music and awareness are our most important ingredients, The Love Movement agreement has been set up. We work together with international clubs and artists who are open to a conscious movement that, in addition to their own strengths, offers our future a better perspective. After a successful collaboration with the label Halocyan in 2018 we look forward to the edition of May 4 where we invite the one and only DOSEM and partner in music ALEX PI for a night full of the most delicious techno tracks. Stepping into 2019 having spent the latter part of 2017 and 2018 buried away in the studio, it’s fair to say that Dosem is armed and ready to bring a slew of creative output to the table. One of his immediate projects is the development of his Houstrike brand, which has become his multimedia lab for exploring deeper and darker sounds. Ever seeking musical versatility, Dosem plans to enrich Houstrike with a flourishing stream of new output.